Maintaining your dental implants is just as important as cleaning your natural teeth. Perfect Smile is here to give you some helpful information on keeping your implants clean for long-term dental health. 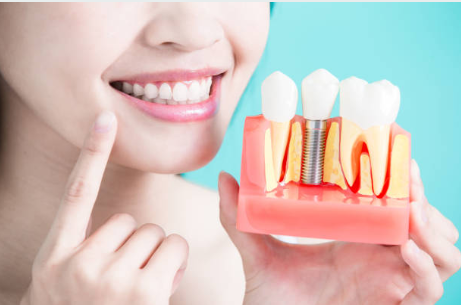 Something you may have not known about dental implants is they not only look, act, and feel like real teeth but caring for them is quite similar as well. If you keep your teeth clean and protect your dental implants, they can last years – up to a lifetime. As with normal teeth, you should brush implants about two to three times a day and floss between your teeth every day. Even though implants cannot develop cavities, plaque and tartar can still build up, which can affect your other teeth, leading to bad breath, decay, and gum disease and potential dental implant failure. Visit Perfect Smile for regular check-ups and cleanings. At Perfect Smile Dental we recommend regularly scheduled check-ups in or order to maintain the overall health of mouth – including your dental implants. Watch for signs of infections. While dental implants are indistinguishable from your natural teeth, there is one specific way in which they differ. Small fibers connect your gums to your natural teeth, and these fibers help prevent food particles from becoming lodged between your teeth and your gums. The gum tissue doesn’t connect to your dental implants in the same way, so you will need to be cautious when eating foods with small seeds or other particles that could become stuck. If you experience any signs of infection such as redness, swelling, or a pimple-like lesion on the gum tissue around your implant, please call Perfect Smile Dental right away so we can schedule an evaluation and stop a small problem from becoming bigger. If you have further questions about your dental implants or proper post-treatment care, contact Perfect Smile today for a consultation and appointment for check-ups and/or cleanings.